With the dawn of the gig economy, it can be very profitable to take your time and your talents into your own hands. You can leverage your special talents, or even your most basic skills, because there’s a place for you in the booming business of side hustles. Here are five side hustles that are popular among millennials. Be it site content, social media posts, or the occasional blog post, there is no better way of attracting inbound leads than having an engaging content. Millennials are capitalising on this new market in a big way. Every company has a blog and a social media presence nowadays, so the market for this type of work is huge, and there is a lot of space for specialised content. If you have a passion for a specific niche, creating themed content can be a great way to leverage on even the weirdest of hobbies. Model airplane aficionado? Calligraphy enthusiast? Reptile expert? There’s a niche for everyone, and once you’ve made a name for yourself on a personal blog, the rates you can charge can become proportional to your fanbase. 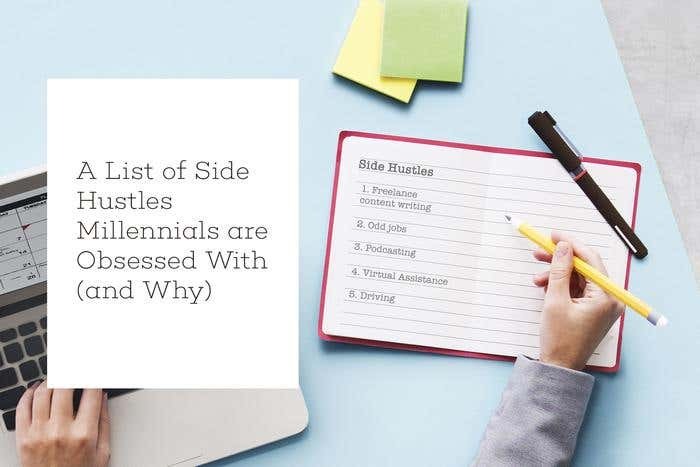 Millennials are often seen as a helpless and unfocused bunch, but given the numbers of them that make money doing odd jobs — furniture assembly, montage, and various handiwork — this impression seem to be missing the mark. Anyone with a few basic skills can capitalise on them and create a great parallel source of income, given that the hourly rates can be substantial. Browse Freelancer’s Local Jobs and you’re on the shortest way to getting some cold hard cash in your spare time by helping out someone that isn’t that handy or just doesn’t have the time. The popularity of audio content has been soaring in recent years. People love to listen to podcasts on their commute while working out or running errands - there’s a lot of time to fill with engaging content in our busy modern lives. If you have a passion or are an expert in a certain field, there is almost a guaranteed audience for your voice. It’s never been easier to create a podcast, you just need a basic recording device, even a smartphone can often suffice. It’s also never been easier to monetise it, given that advertisers in your niche are extremely eager to pay great money for airtime during podcasts because the audience’s interests are usually concentrated already on the topic of the podcast. So, if you have a podcast about wellness and healthy living, it might be highly profitable for a company that produces diet snacks to advertise in your show. We live hectic, overbooked lives, so a lot of people need help coordinating their day to day activities, and running the digital errands that have started to become all encompassing. So, there’s a definite need for people to step in and help. That’s where you can come in. If you’re great at answering emails, scheduling appointments, making reservations, and chatting on the phone, maybe becoming a virtual assistant can be a very lucrative side gig. These positions are usually part-time, and you can find a whole lot of them on Freelancer.com’s job board for virtual assistants. With the soaring popularity of apps like Uber and Lyft, millennials can make some serious cash from one of the most basic skills there are: driving. You don’t even need to have a car of your own, as the companies often have great rental schemes, where your only inputs are your time and driving skills. This is the ultimate gig in terms of flexible working hours as well, as some of the best paid time slots are sometimes at odd hours anyway — it’s definitely not your average 9 to 5. Want to have a side hustle while keeping your day job? Here are a few ways to make it work for you. Find more side hustles here. Hi there! My name is Alex and I work on Recruiter projects at Freelancer.com. If there is anything I can help you with, please let me know. I'm here to support employers and freelancers to get their projects completed from start to finish. I'm very excited to have you as part of the community and look forward to working with you.